The banana split is a banana and ice cream dessert served in a long dish known as a boat. A banana is cut in half lengthwise (split) and laid in the dish. 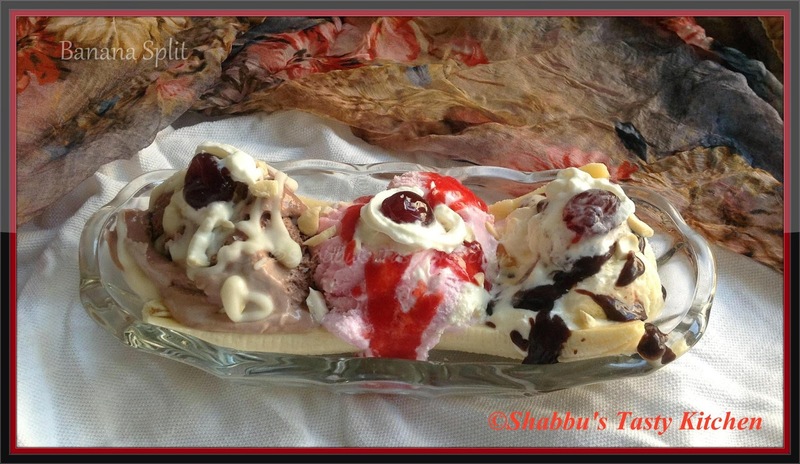 The classic banana split is made with scoops of vanilla, chocolate and strawberry ice cream served in a row between the split banana and pineapple, chocolate and strawberry sauces are poured over the ice creams. Peel the banana and halve it lengthwise and place it in a long dessert dish. Place one scoop each of vanilla, strawberry and chocolate ice cream onto the banana. Pour chocolate sauce over vanilla ice cream, strawberry sauce over strawberry ice cream and white chocolate syrup over chocolate ice cream. Squirt a small amount of whipped cream onto the tops of the ice cream balls.